I have 2 teen girls still at home, so I’m thinking that you can probably guess just how much these girls cost to clothe! That’s only of course if I gave in to their every whim and fashion desire. It’s also another reason I’ve learned to mend and starch thrift store finds. 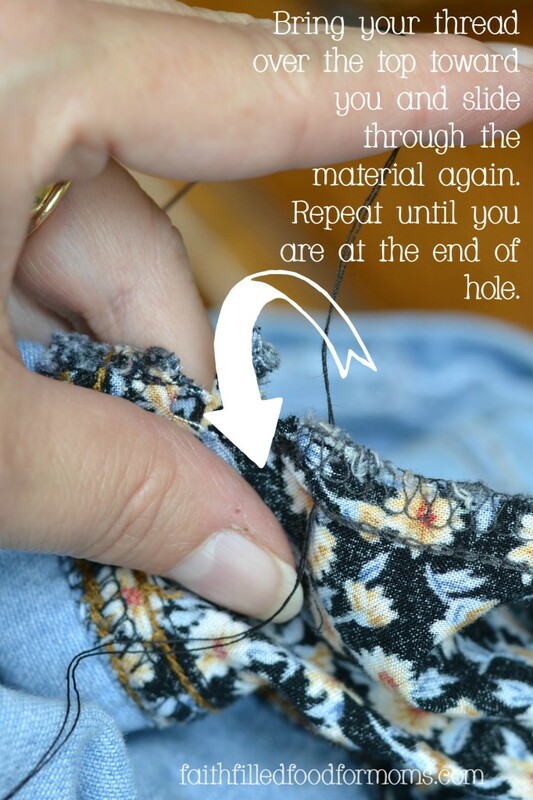 I’ll show you how in this Step by Step Beginners Tutorial How to Sew a Small Hole! Just a little mending and BOOM you’ve got like brand new clothing from the Thrift Store. Use these other Creative Money Saving Tips to Save Thousands this year too! 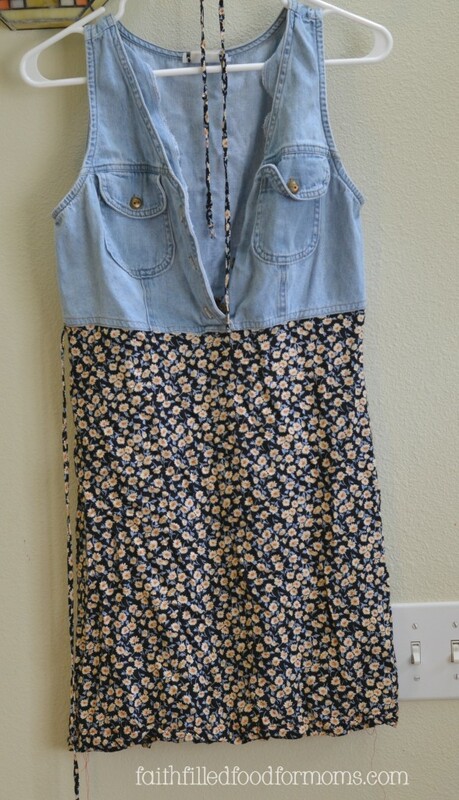 Since I’m such a frugal mama one thing that has saved us TONS OF MONEY (and I mean TONS) is making thrift store finds and clothing look brand new with a little mending and a little spray starch. We live in a society where we can buy new clothing and a couple months later throw it away because it doesn’t cost that much to buy new clothes anymore…some of them anyway. However I can not bring myself to throw clothing away! 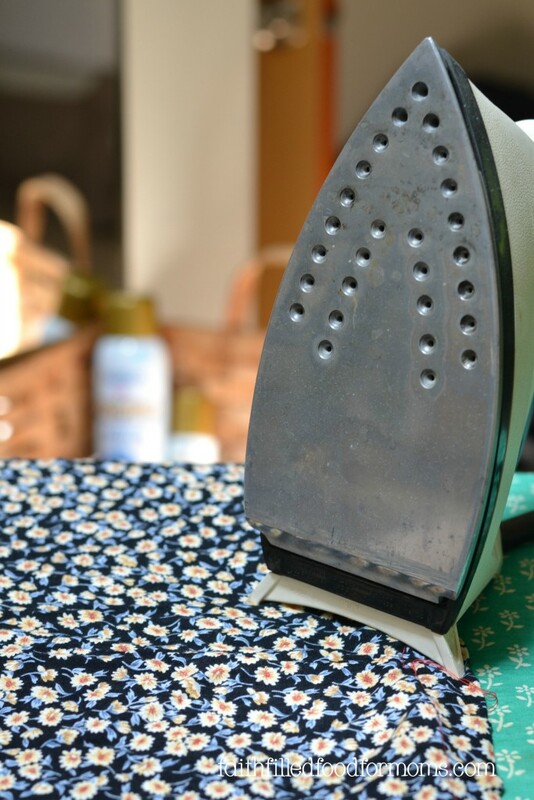 Back in the day if your clothing ripped or got wrinkled you would simply repair and iron. I have many friends that will not or can not mend a simple little tear. The funny thing is that I only learned this maybe a few years ago. 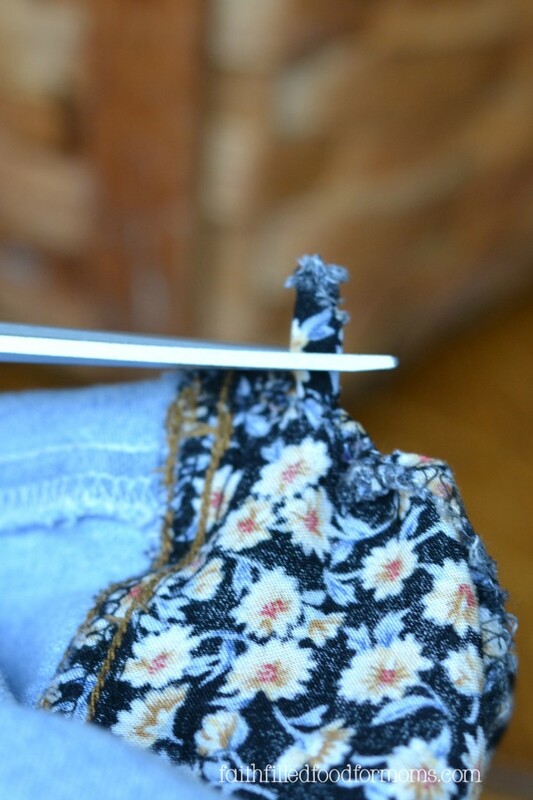 I thought everyone could sew on a button or mend a little tear or sew a hem. Nope! The other day the wire from one of my daughters underwire bras came poking out. Now you can just take those out and the bra is still good BUT my teen wanted that wire in there! Sooo instead of running out and buying a $40 bra, I simply pushed the wire back in and sewed the little hole closed. You can do this friends! It’s really pretty relaxing to mend clothing, not to mention the satisfaction of rescuing perfectly good clothing from the junk pile. So I’m going to show you how to…. 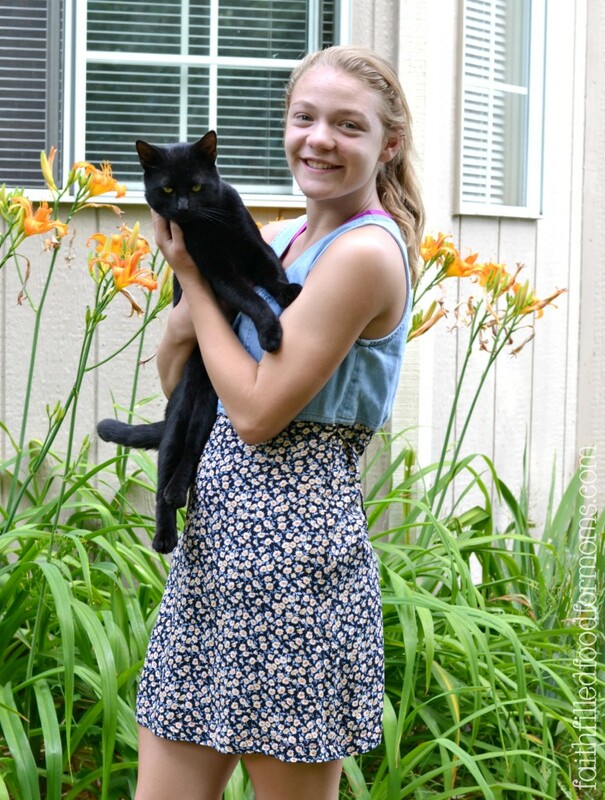 There are also tons of cheap online classes you can take like on Craftsy.com to learn to sew. So after you learn this little technique and feel you want to go deeper…hop over to the Craftsy Sewing section and pick a cheap class! You’ll save tons in the long run! There really wasn’t too much wrong with it just a hole in the side where the tie string was suppose to be. It looked like someone had tried to repair it already and the tie string was dangling from a thread. Plus it was super wrinkled. This was a super easy fix! Especially when you have material that has tons of design, you don’t have to do an A+ perfect job! This is what you do. Choose a thread color that closely matches the material. I used black because that is what is in my kitchen drawer and I was too lazy to go up to my sewing area to find something perfect…because I knew it wouldn’t matter with all the pattern of the material and the place that I would be sewing. 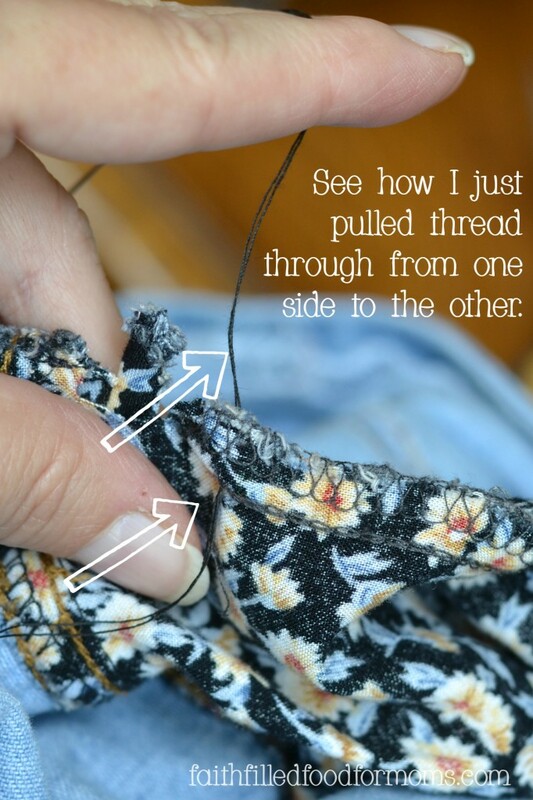 Thread your needle…Do you know how? If you don’t then I need to do another post! Notice how I stuck the string through the opening? I want you to also notice I’m just holding it and it’s NOT perfectly lined up. 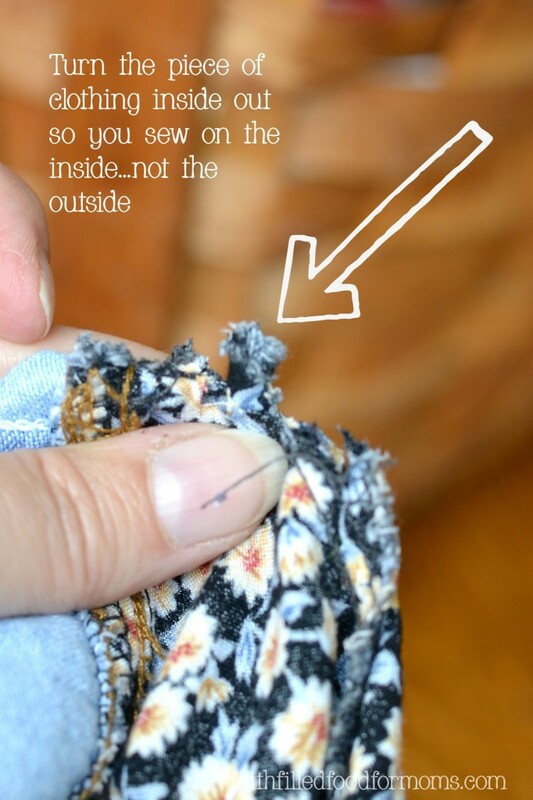 You can pin it perfectly, it just depends on the type of mend you are doing. It’s ok… Now simply slide your needle from one side to another. 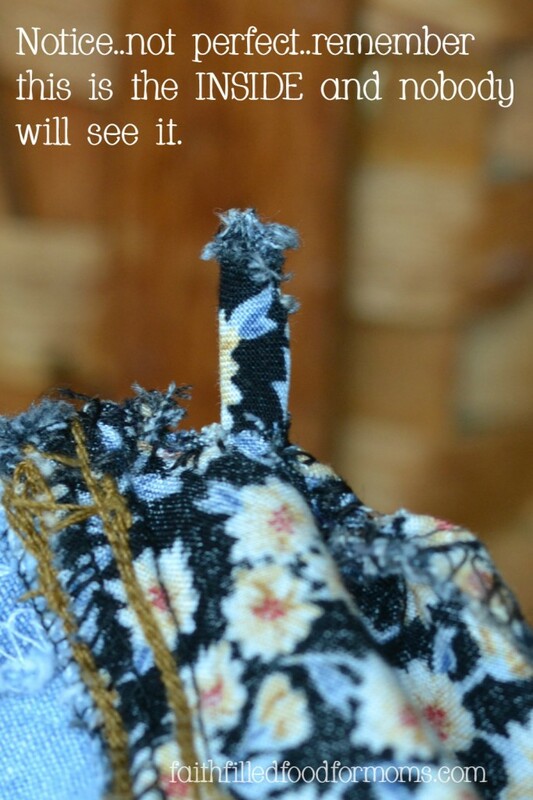 Now bring the thread over the top toward you and push through again…over and over. You can go from left to right or right to left. You can bring the thread toward you or push away from you. I like to bring the thread over toward me because then I can see better to keep my row of stitching straight when I push the needle through again. Notice that my mend is NOT perfect! Who cares…you’ll see in the end! I then snipped off the little tie string on the inside so it wasn’t pokey. Now….turn right side out and LOOK! 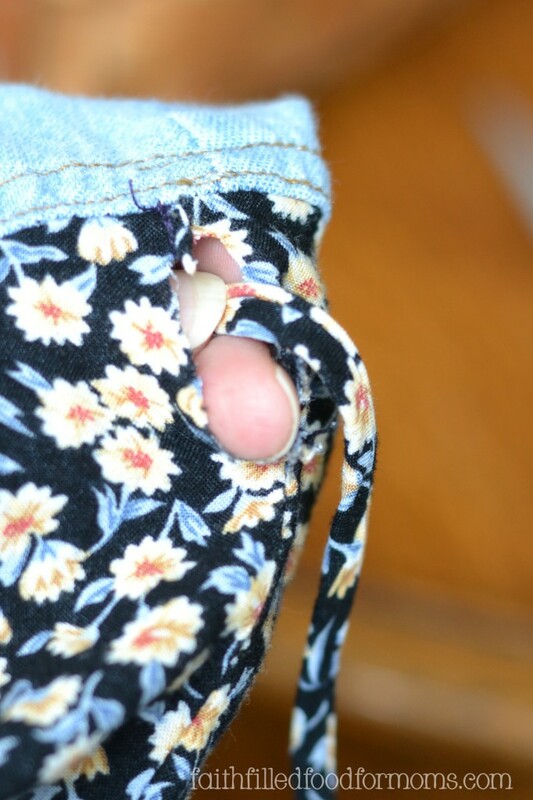 Can you tell how imperfect I mended that little hole…nope. Now we’ve got to iron and give it a little pick me up with some Faultless Spray Starch! 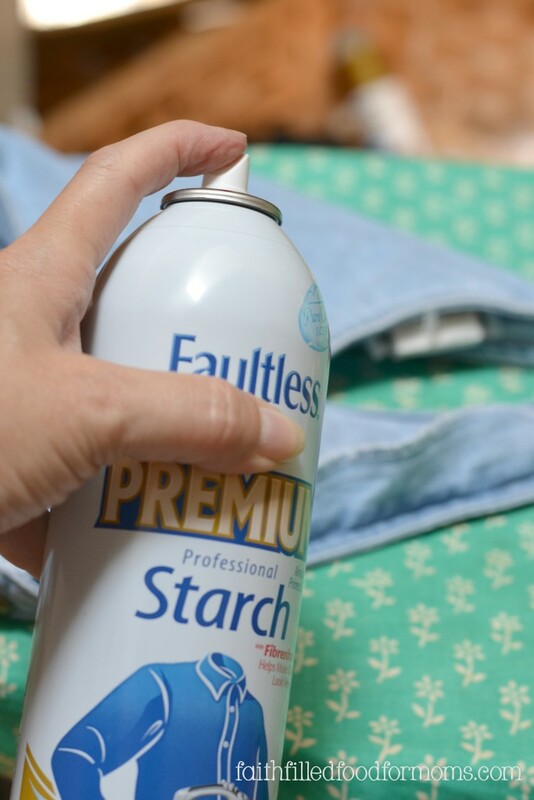 I love Faultless Premium Starch…it truly makes a garment look and smell so fresh and new! Back in the day, starches smelled…chemically, but now YUM! My iron and ironing board are ancient and I mean really ancient…probably about 35 years old at least! I don’t always pull my big ironing board out, but I have it in my bedroom for the occasion that I want to freshen up something that I’ve pulled out of the laundry…umm clean laundry. Anyway…. All you do is spray some yummy Faultless Premium Spray Starch on the fabric and iron and oooh it turns out so nice! It isn’t stiff or sticky like you might imagine. More like brand new when you buy it. Makes your fabric flow super nice. I’d say this project took me about 15 minutes tops…maybe less. (well I was taking pics..so longer) BUT it would have only taken 10 ~ 15 min. What I want to stress more than anything is that YOU can mend and starch almost anything. 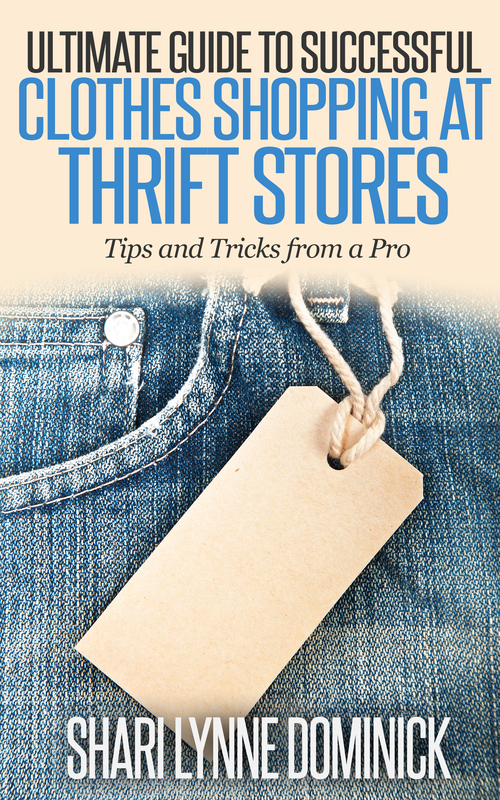 Older clothes, newer clothes, thrift store clothes…anything! Just so you know…I have had friends come to me with the most unbelievable mending and tailoring! YES tailoring…I’ve looked at the job and handed the clothing item back and said “that just can’t be done…I can’t do that!” Guess what? Each time they’ve begged me to try…and sure enough each project has turned out perfect! No kidding. It’s really a matter of just giving it a try! 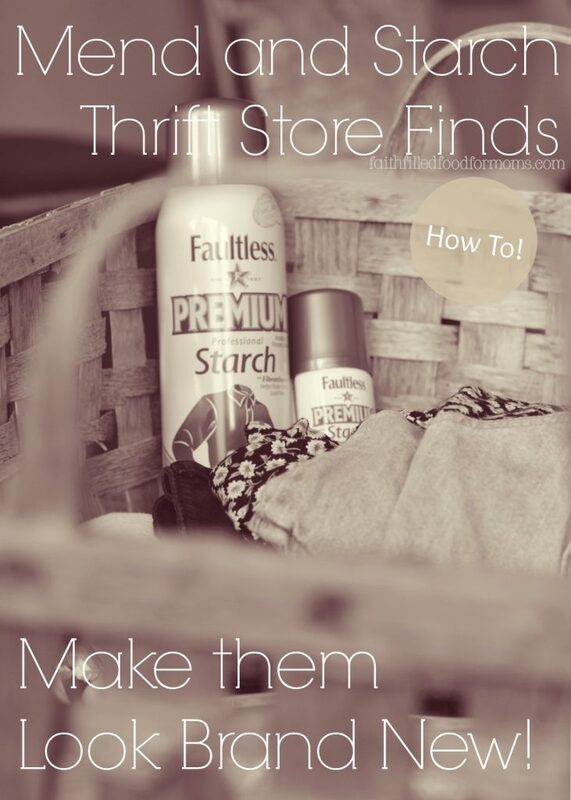 Also…Using a little Faultless Premium Spray Starch may seem a little old fashion…but I can assure you, just a little tender loving care and you’ve got a $2 outfit that looks more like $20! 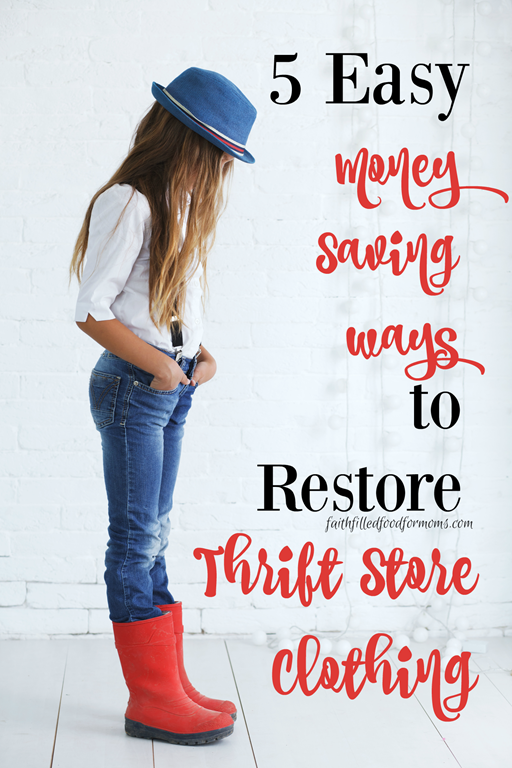 Mending and thrift store shopping go hand in hand. I can’t wait to try the premium starch. I found this by chance. I, too, do stuff like you do…actually mend and change stuff. Lol. Sewing isn’t as hard as it’s cracked up to be. Ya don’t have to be perfect! People are amazed at what I do, but it’s not that hard! Hi Cindy! Thanks for stopping by and taking time to comment. 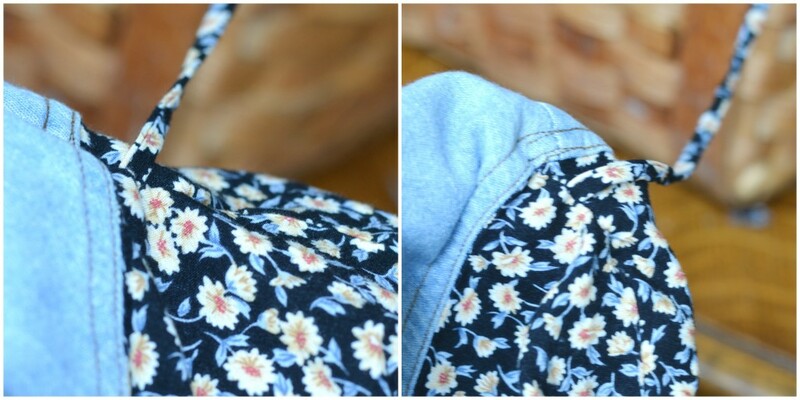 It’s so amazing what a couple of little stitches can do to a piece of clothing, bag or whatever! Would love to keep in touch. Have a blessed weekend!